after she was allegedly used for ritual by some fake internet fraudsters who are fully into rituals known as Yahoo 'Plus' Boy. The woman in question is not a young girl but a married woman. 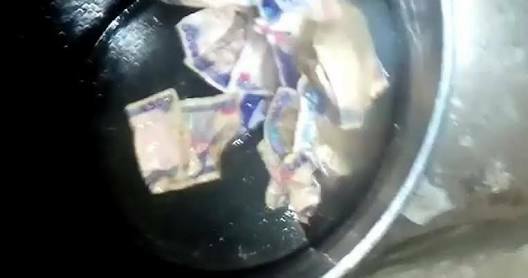 There was panic on Sunday in Ogaga Street, Effurun area of Delta state when a woman, Mariam Abdul, was allegedly found vomiting cash early Sunday morning. “That on Saturday 22nd December, his wife started experiencing strange spiritual attacks and then he invited a pastor and when he started praying for her, she started vomiting water including 14 pieces of N500 notes. The victim had been taken to hospital but when they are done the case will be transfer to state CID,” he said.